In order to obtain a Nated National Certificate (Electrical Engineering N1-2), a student is required to take a total of 4 subjects. In order to obtain a Nated National Certificate (Electrical Engineering N3), a student is required to take a total of 4 subjects. In order to obtain a Nated National Certificate (Electrical Engineering N4-6), a student is required to take a total of 4 subjects. 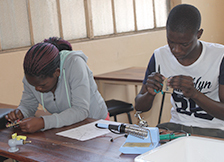 The Nated National Certificate (Electrical Engineering), programme is a full or part time three (03) months programme at each of the Nated (N). A student is issued with a certificate on the successful completion of each Nated. (N) of study, that is N1, 2, 3, 4, 5 and 6. What career opportunities do I have after completing the Nated National Certificate (Electrical Engineering)?